Cultic images and miracle-making icons, in particular, worked as pivotal points around which Spanish American communities fashioned their local identities and civic pride. Explorations of the several placements and displacements of artistic images within colonial Maracaibo reveal the ways in which they related to the social and political life of the city. By tracing the shifting physical and social life of Maracaibo’s artistic images, the article captures the contesting identities that defined this prosperous colonial settlement. Among the many manufactured goods coming from different areas of the New World, Maracaibo also received numerous works of art destined to the embellishment of churches, chapels and aristocratic homes. The study of the circulation and placement of those images reveal interesting insights about the socio-political dynamics of the colonial city. (6) Here we should exercise caution, however, as most of what we consider today “artistic” pieces, were at the time crucial cultic instruments, “living” entities around which the city and its citizens constructed their own identities. In recent years several scholars have discussed how cultic images and, in particular, miracle-making icons worked as pivotal points around which Spanish American communities fashioned their local identities and civic pride. (7) Thus, I want to explore several placements and, in some cases, displacements of artistic images within colonial Maracaibo as a means to reveal, not so much the spiritual power the inhabitants placed on those images, but the ways in which they related to the social and political life of the city. As Richard Kagan has extensively discussed, during the 17th and 18th centuries the word ciudad had a twofold meaning in the Spanish world: civitas, the city as a community, and urbs, the city as an architectural entity. (8) I will discuss Maracaibo in the former sense – by tracing the shifting physical and social life of Maracaibo’s artistic images, I attempt to capture the contesting identities that defined this prosperous colonial settlement. According to Richard Kagan, within the Spanish empire, each city strove to define its genius loci, the community’s particular sense of itself. However, this genius loci was not equally shared by every inhabitant of a particular town. (9) As we will see, Nueva Zamora was not the exception to this rule. By the late 17th century, Maracaibo was divided into two clear spaces, roughly delimited by an axis located in what is today the 8th avenue in the city’s historical center. (10) Towards the East stretched out the “Maracaibo blanca,” or the area populated by the city’s authorities and aristocrats, mostly composed of Spaniards and Creole whites. Like most Spanish colonial cities, this section was organized following a grid plan, with a plaza at the center, flanked by the parish church of St Peter and St Paul, the city hall, the market, and other government buildings and houses of the city’s elite. To the West of the city, the “Maracaibo mestiza” concentrated the poorest social groups, most of them of mixed racial background, who lived in the periphery of, but at the same time closely linked to, the “Maracaibo blanca.” Its inhabitants were mostly common workers – servants, fishermen, artisans, carpenters, shoemakers, construction workers. Within this section of the city, the shrine of San Juan de Dios catered to the spiritual life of the population. 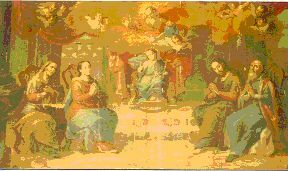 Another outstanding evidence of the intense commercial exchange between Maracaibo and Mexico in the 18th century, is a painting that is today located in Maracaibo cathedral, but that must have belonged to the Jesuit school at Punta de Arrieta. The Exaltation of the Regina Societatis Jesu (fig. 1), painted in 1765 by Miguel de Cabrera, the most important artist of 18th-century New Spain, seems to indicate the ambitious plans the Society of Jesus had for their establishment in Maracaibo – in this monumental composition, the Immaculate Conception protects with her mantle the most distinguished members of the Jesuit Order: St. Ignatius of Loyola, St. Francis Borgia, St. Francis Xavier, St. Louis Gonzaga, St. Stanislav Koska, among others. (14) During the mid-18th century, the Jesuits repeatedly requested royal authorization to establish a Jesuit college, where the children of the powerful local families could expand their education. However, the project for this institution of higher education was frustrated by the expulsion of the Order from Spanish territories in 1767. (15) It seems, thus, that by importing fine artistic images to decorate their temples, Maracaibo’s elites of the 18th century not only reasserted their commercial connections, but also their cultural and spiritual dependence from the most sophisticated Spanish colonial center. Earlier on, however, Maracaibo’s authorities would make use of other means to boost the religious life of the city. Using similar strategies to those that made them an economic power in the Caribbean, in the early 17th century Maracaibo took possession of a prestigious miraculous image that belonged to a competing trade center, monopolizing thus the spiritual life of the region. I am referring here to the famous Black Christ of Gibraltar (fig. 2), whose story is closely tied to the prolonged struggle between the two main centers in Maracaibo Lake, Nueva Zamora and Gibraltar. 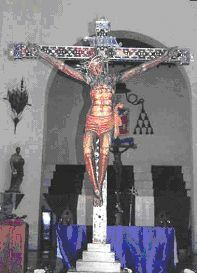 For safekeeping purposes, the Crucifix was transported to Maracaibo and placed in its parish church, until the town of Gibraltar could be reconstructed. Years later, when Gibraltar’s city and temple had been rebuilt, and the inhabitants of Gibraltar reclaimed their miraculous image, Maracaibo refused to comply on the grounds that the devotion to the Black Christ was too rooted in the city as to let the image go. Since both Maracaibo and Gibraltar insisted on their rights over the image, the dispute was taken to the Council of Indies in Seville, which ruled to leave the decision up to the Black Christ himself. The Council disposed that, when the winds were blowing towards Gibraltar, the Crucifix was to be left on a boat situated in a spot in the middle of Maracaibo Lake, equidistant to Maracaibo and Gibraltar. The image would belong, thus, to the city towards which the boat would make its way. According to Gómez Espinoza, however, the real story dates back to the early 17th century, when an official from the Royal Treasury, don Juan de Andrade, was relocated from Santa Fe de Bogotá to Nueva Zamora de Maracaibo, and brought with him an image of Our Lady of Chiquinquirá. 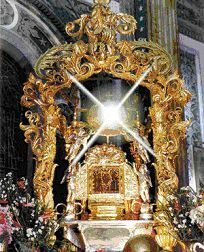 He found the shrine of San Juan de Dios in such a poor state that he decided to repair it and place there the Neogranadine image, which fell into oblivion until the miracle story revived its devotional use. (21) As a result of the reputed miracle, between 1767 and 1778, the old shrine was substituted by a temple built in the local bahareque technique and covered with roof tiles – the type of construction materials that were used for the temples and buildings of the “Maracaibo blanca.” It seems, thus, that by means of this cultic image the “Maracaibo mestiza” reasserted its presence within the social fabric of the city, establishing a new ritual center that could challenge, and would eventually outshine, the traditional ritual center of Maracaibo’s colonial power. It is important to note that by means of the miracle story, the “Maracaibo mestiza” did not establish links with the major centers of royal authority, such as Mexico City, but with a modest pilgrimage center in Neogranadine territories. This connection, however, is particularly relevant since, by the same time Chiquinquirá’s miracle legend was taking shape, intense political struggles for the jurisdiction of the Province of Maracaibo had confronted again Venezuela and the New Kingdom of Granada. (22) In 1777, with the creation of the General Captaincy of Venezuela, Maracaibo and the whole Province of Mérida de Maracaibo were integrated to the new political entity. This decision was repeatedly contested by the city of Maracaibo, which had more interests in common with the viceregal center in Bogotá, than with the remote Province of Caracas. Recent studies have examined how religious icons become important part of a communal identity, since image veneration is one of the means by which believers can participate in the public life of a city. Moreover, the culture of miracle-making images was an arena in which difficult issues of political, economic and religious authority were sorted out in times of crisis. (23) In this light, the particular choice of a Neogranadine image within Maracaibo shifting political context seems to endorse the popular feelings of the city of Maracaibo, which defined its citizenship as linked to New Granada. This failure of influential social segments within the city becomes understandable when we consider the increasing importance that the mixed population of Maracaibo had acquired towards the second half of the 18th century. According to a census carried out in 1756, 53% of the Maracaiberans were of mixed ancestry, most of them descending from Afro-Hispanic roots and classified under the rubric of “libre” or “pardo”. This means that the “Maracaibo mestiza” mostly comprised free workers, with possibilities for social advancement, and thus more participation in urban life. Indeed, from the end of the 18th century until our days, the spiritual epicenter of the port city displaced towards the “Maracaibo mestiza,” to the temple of San Juan de Dios with its miraculous icon of Chiquinquirá. Ironically, Maracaibo the wealthy city of the Caribbean that attracted the greed of pirates and buccaneers, and that could import expensive paintings from New Spain, structured its civic and religious life around of a humble but “living” image, which could monopolize and respond to the aspirations of an increasingly mixed population. Fig. 1 Miguel de Cabrera, The Exaltation of the Regina Societatis Jesu, 1765. Maracaibo Cathedral. Photo: author. 2. For more information on pirate incursions in the coasts of today Venezuela, see López Zea (2003) and Lucena Salmoral (1994). 3. Several scholars from the Centro de Estudios Históricos at the Universidad del Zulia have discussed the economic dynamics of this region. See Cardozo Galué (1983) and Parra Grazzina (1991). 4. On the commercial connections between the port of Maracaibo and Mexico see Arcila Farías (1950). 5. See Cardozo Galué (1983). 6. For a study on pictorial production and circulation in colonial Maracaibo see Domínguez Torres (1993). 7. See for the case of Perú, Cummins (1996), and for New Spain, Alberro (1988), among others. For an inventory of all the miraculous images of the Virgin that appeared in Venezuelan territories see Nectario María (1930). 8. For the implications of the word “city” in early modern Spain see Kagan (2000), 9-11. 10. Vázquez de Ferrer (1986), 8-32. 12. The original inventories have been published in their entirety in Martí (1969). 13. Five of these pictorial relics of colonial Maracaibo can still be observed in its cathedral, and one in the Archdiocesan Museum. See Domínguez Torres (1993), 79-82. 14. See the study made by Solaeche y Llanos (1962-1963). 15. Documents and details about this frustrated project are found in Rey Fajardo (2003). 16. For the full story of this relic see Besson (1973). 17. The devotion to the “Black Christ of Maracaibo” (the name by which the image will be known from that moment on) traveled beyond the Caribbean. The Cathedral of Seville, for instance, has a chapel dedicated to this devotion, with an altarpiece featuring a painted image of Maracaibo’s crucifix. 18. Homick (1985) reconstructs the complete history of these two competing provinces and their subsequent integration. 19. For the full history of the apparition in Colombia see Arizmendi Posada (1986). 20. For complete accounts of the miracle in Maracaibo see Nectario María (1970). 21. Gómez Espinoza (1992), 129-130. 23. See, for instance, Ragon (1995). 24. Domínguez Torres (1993), 95-97. 25. For more information on this dispute see Febres Cordero (1911), 126-163. Alberro, Solange. Inquisición y sociedad en México, 1571-1700. México, DF: Fondo de Cultura Económica, 1988. Arcila Farías, Eduardo. Comercio entre Venezuela y México en los siglos XVI y XVII. México, DF: Colegio de México, 1950. Arcila Farías, Eduardo. Economía colonial de Venezuela. Caracas: Italgráfica, 1973. Arizmendi Posada, Octavio. Chiquinquirá: 400 años. Bogotá: Litografía Arco, 1986. Besson, Juan. Historia del Estado Zulia. Maracaibo: Ediciones Banco Hipotecario del Zulia, 1973, t. 1. Cardozo Galué, Germán. Maracaibo y su región histórica. Consideraciones preliminares y selección de testimonios de los siglos XVI al XIX. Maracaibo: Universidad del Zulia, Centro de Estudios Históricos, 1983. Cummins, Tom. “A Tale of Two Cities: Cuzco, Lima, and the Construction of Colonial Representation” Converging Cultures: Art & Identity in Spanish America. Edited by Diana Fane. New York: Brooklyn Museum, Harry N. Abrams, 1996. Domínguez Torres, Mónica. “Aproximación historiográfica a la pintura colonial del Estado Zulia.” Honors Thesis, Universidad Central de Venezuela, 1993. Exquemelin, A. O. The Buccaneers of America: A True Account of the Most Remarkable Assaults Committed of Late Years Upon the Coast of the West Indies by the Buccaneers of Jamaica and Tortuga, Both English and French. Glorieta, NM: Rio Grande Press, 1992. Febres Cordero, Tulio. Documentos para la Historia del Zulia en la época colonial. Maracaibo: Imprenta Americana, 1911. Gómez Espinoza, Antonio. Historia fundamental del Zulia. Maracaibo: Corpozulia, 1992, vol. 2. Greer, Allan and Jodi Bilinkoff, eds. Colonial Saints: Discovering the Holy in the Americas, 1500-1800. New York: Routledge, 2003. Homick, Stephen J. “Reform and Rebellion in Western Venezuela: A History of the Province of Merida de Maracaibo, 1739-1784.” PhD diss., University of Connecticut, 1985. Kagan, Richard L., and Fernando Marías. Urban images of the Hispanic world, 1493-1793. New Haven, Conn.: Yale University Press, 2000. López Zea, Leopoldo Daniel. Piratas del Caribe y Mar del Sur en el siglo XVI, 1497-1603. México, D.F. : Universidad Nacional Autónoma de México, Facultad de Filosofía y Letras, Programa de Posgrado en Estudios Latinoamericanos, 2003. Lucena Salmoral, Manuel. Piratas, bucaneros, filibusteros y corsarios en América: perros, mendigos y otros malditos del mar. Caracas: Grijalbo, 1994. Martí, Mariano, Bishop. Obispo Mariano Martí: documentos relativos a su visita pastoral de la Dióecesis de Caracas, 1771-1784. Estudio preliminar y coordinación por Lino Gómez Canedo. Caracas: Academia Nacional de la Historia, 1969. Nectario María, Brother. Los orígenes de Maracaibo. Maracaibo: Publicaciones de INCE, 1977. Nectario María, Brother. 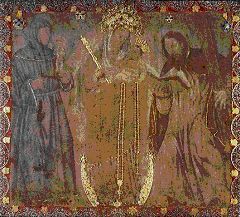 Historia de Nuestra Señora de Chiquinquirá de Maracaibo: patrona del Zulia. Maracaibo: Escuelas Profesionales "Sagrado Corazón", 1970. Nectario María, Brother. Venezuela mariana, o sea, Relación histórica compendiada de las imágenes más célebres de la Santísima Virgen en Venezuela. Coro: s.n., 1930. Parra Grazzina, Ileana. Las comunicaciones en el occidente venezolano: rutas y puertos (siglos XVI y XVII). Maracaibo: Universidad del Zulia, Centro de Estudios Históricos, 1991. Ragon, Pierre. “Images miraculeuses, culte des saints et hispanité dans le Mexique colonial (1648-1737)” La religion civique à l’époque médiévale et moderne: Chrétienté et Islam: actes du colloque. Rome: Ecole française de Rome, 1995, 481-495. Rey Fajardo, José del. Virtud y letras en el Maracaibo hispánico. Caracas: Universidad Católica Andrés Bello; Maracaibo: Alcaldía de Maracaibo, 2003. Solaeche y Llanos, Carlos. 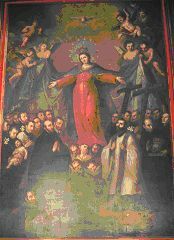 “Sobre una pintura del México colonial en la iglesia de Santa Ana.” Boletín del Centro Histórico del Zulia 4, no. 13-16 (1962-1963): 57-62. Vázquez de Ferrer, Belín. El Puerto de Maracaibo: elemento estructurante del espacio social marabino (siglo XVIII). Maracaibo: Universidad del Zulia, Centro de Estudios Históricos, 1986.